Once again, everyone was busy and it was hard to get us all in one spot long enough to relax and focus. But, we did succeed. We started with a Three Realms Meditation called The Tree of Life. 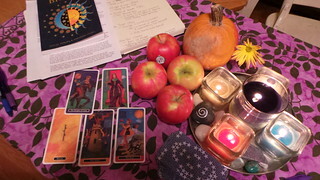 Then, we asked for a little divinatory guidance, using Tarot, reflecting on our thoughts in our family journal. 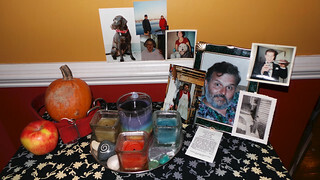 We created a little ancestors altar, with pictures of family members that have passed and a few seasonal mementos. show me that death is but the gateway to life. Finally, we talked about our plans to minimize our media consumption for the month of November. We closed the circle and all returned to our respective tasks.